Front style for CB750/GL1000/GL1100/GL1200 Std. Two signal lens for CB750/GL1000/GL1100/GL1200 Std. Click for details Honda CBR600F/XL600V Transalp Front Left Turn Signal. Click for details Honda CBR600F/XL600V Transalp Front Right Turn Signal. 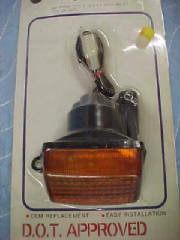 Click for details Honda TLR/XL/XR 83-92 Front Left Side Turn Signal. 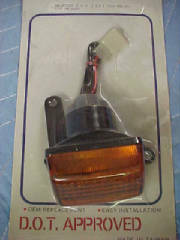 Click for details Honda TLR/XL/XR 83-92 Front Right Side Turn Signal. Click for details Honda TLR/XL/XR/NX 83-93 Front/Rear Turn Signal. Click for details Honda VF500/700/750/CBR/VF1100S Front Right Side Turn Signal. Click for details Honda VF500/700/750/CBR/VF1100S Rear Right/Front Left Signal.